Such a fun evening with the girls last Saturday! 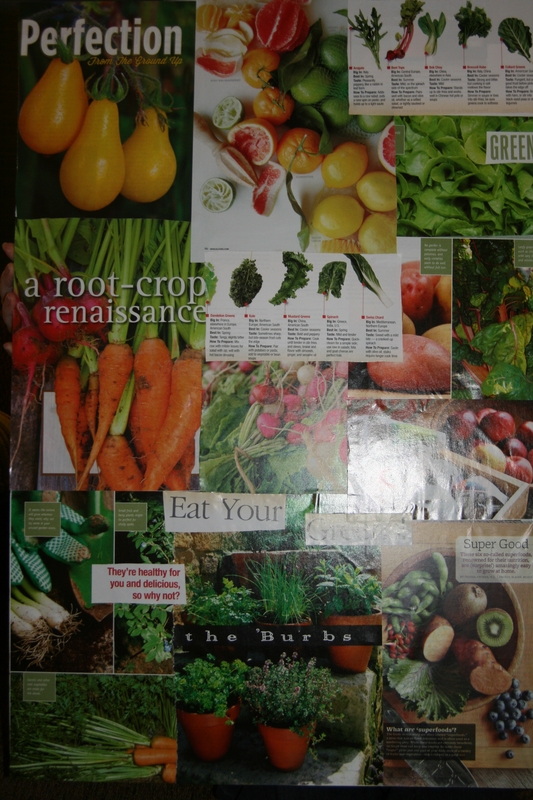 I rounded up three friends and with a lot of magazines, scissors and glue, we created our vision boards. To get the visions flowing and to learn more about these great women, I poured us all a glass of wine and then asked each to share what their past year had been like and what they wanted for the upcoming year, etc. Listening to the challenges of the past year and the hopes and dreams for the future year was really fun. Each of these women are strong, confident, capable and caring. Listening to their stories was so fascinating and I have to say, this coming year is going to be great! One gal was recently out of a long-term relationship and had re-located to change her life. She felt she had been accommodating, giving in, doing what others wanted, way too much and needed to focus on creating balance in all areas of her life. Another had been bucked off a horse the year before and had broken her humerus bone (that’s the one in the upper arm). After a year of stress and extreme pain, as well as 4 surgeries, she is finally able to use the arm again with quite a bit of mobility and a lot less pain. 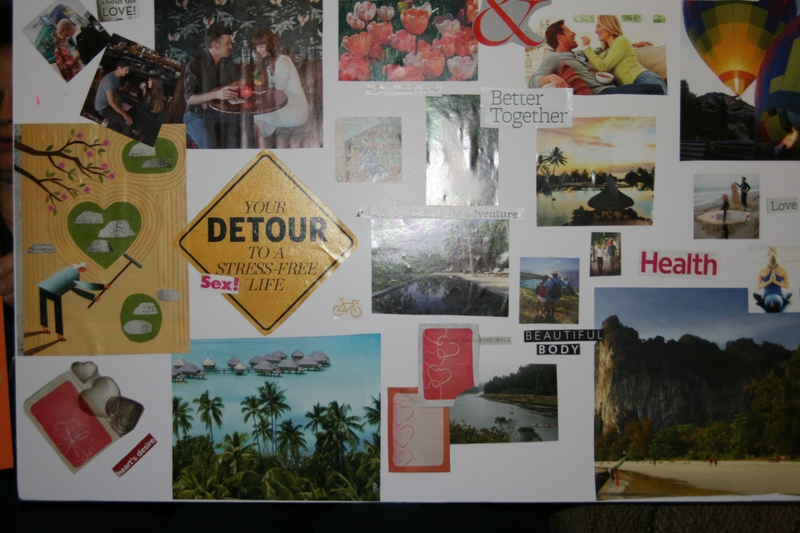 So her goal is to continue to get healthy and to travel with her husband – she made two boards – one for health and one for travel. Another gal was determined to find love. A recent move from one state to another, deaths in her family and a break-up had made the last seven months not exactly happy. So her focus for the year was on joy, love and health. We started our foray into the world of the future at 7 pm. We finished our boards around 11:30pm. Phew! It was so interesting from start to finish. 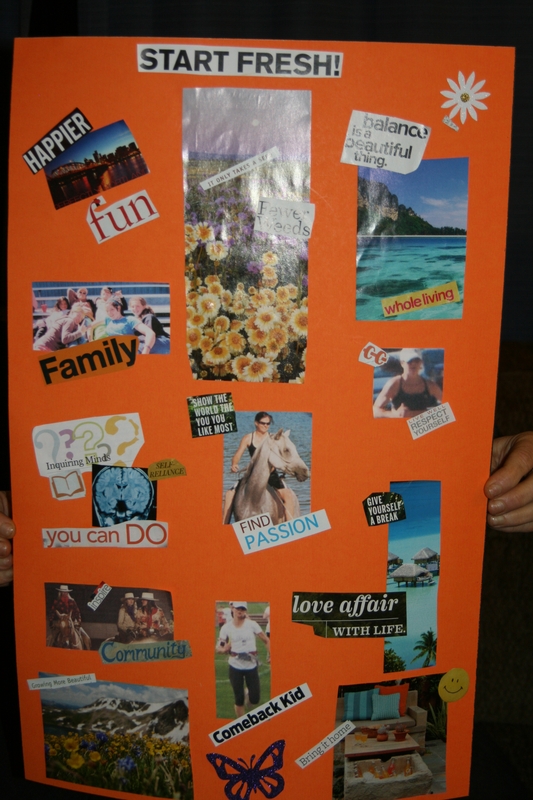 Each of us had had a vision of what our vision boards would look like. But being regulated by the available options within our magazines, each one turned out great, but much different than we had anticipated. A fun experience, with great women. 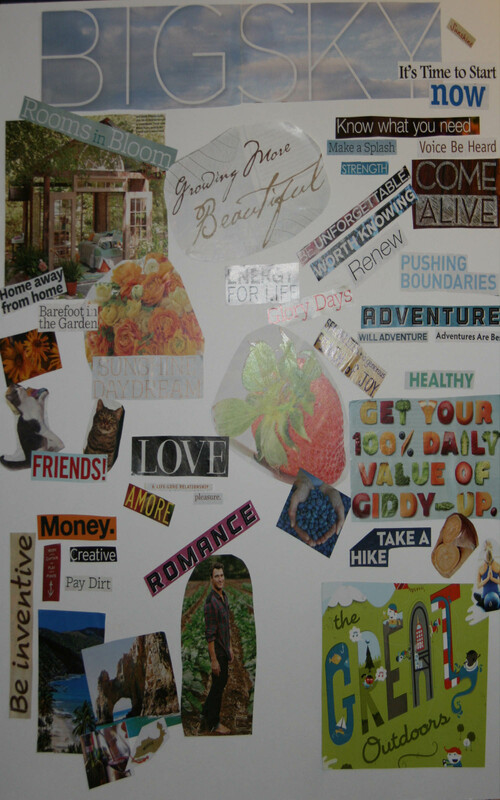 I think we all feel more focused on where we want to put our energy. Now to take action and make it all happen. Here is to a great year!